The Graduate Certificate in Editing and Publishing is part of an articulated program designed to meet a range of needs for people who want to start a career in writing and for experienced writers wanting to further develop their theoretical knowledge and skills. Graduates are able to develop and critically revise their own and others' work and are aware of the place of writing within contemporary cultural formation. They have general skills in creative writing in fiction or non-fiction and a critical knowledge of cultural and aesthetic debates. Students also develop specific industry-based skills in book editing and publishing. Career options include editor, publisher and writer. a curriculum vitae (CV), which should include details of paid and voluntary work or other experiences (eg special interest groups) that could be relevant to the course. This course totals 24 credit points, consisting of two 8-credit-point core subjects and one 8-credit-point subject from a specified list. 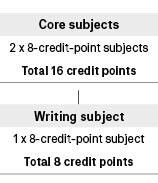 Part-time students should undertake 8 or 16 credit points a session. This course is part of an articulated program comprising the Graduate Certificate in Editing and Publishing, the Graduate Diploma in Creative Writing (C06041), and the Master of Arts in Creative Writing (C04109). Students who successfully complete this course and who are admitted to the graduate diploma or master's course are eligible for recognition of prior learning for completed subjects.